For edging along walkways and planting beds. Adjustable depth control wheel and built-in blade "sight" helps with making the correct cut. 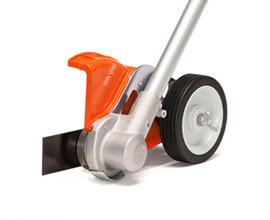 Suitable for all loop handle KombiEngines (KM 56 RC-E, KM 90 R, KM 100 R, KM 130 R) and FR 131 T.
STIHL and VIKING online owner’s manuals are usually for the latest versions of the machine. Your product may be a slightly older production model but the manual will still be appropriate for the relevant model number.